'70s fever has officially struck the high street, and let's just say I'm more than happy to succumb to the throwback-induced delirium. There are no two ways about it: If I had to be transported back to a decade, it would be the '70s (well, fashion-wise, anyway… I'd miss Citymapper too much). I love its leg-lengthening flares, pointed-collar shirts, frou-frou blouses, and of course, the jumpsuits. Oh, the jumpsuits. 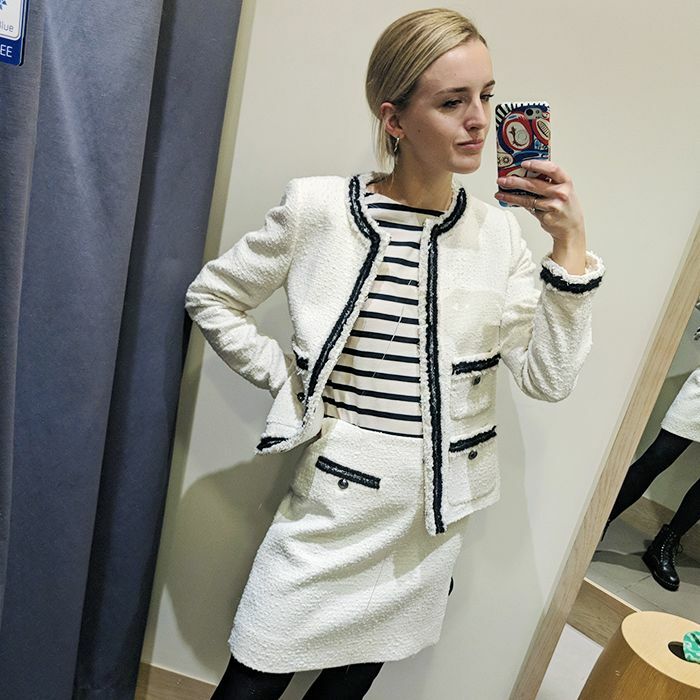 I have long worshipped at the altar of all-in-ones, but this season has seen the retro-inspired piece explode into stores and dominate in the street style stakes. The Scandi crowd went wild for the trend at Copenhagen Fashion Week, and its popularity shows no sign of abating. So what makes the jumpsuit so special? Personally, I think the secret of its success lies in its simplicity. This is the ultimate pull-on piece. The hardest part is finding the fit that works for you (there is one for everyone, trust me). After that, the rest is easy. Just chuck on a pair of lace-up chunky boots, layer up some pendant necklaces, grab a crossbody bag and you're ready to rock. So whether you go for a utilitarian boilersuit or a belted, form-fitted number, you will never regret investing in a jumpsuit (apart from when you have to go to the toilet—no explanation needed). It's by far the easiest way to look chic for spring/summer 2019. Scroll down to see and shop my favourite jumpsuits on the high street. Style Notes: This & Other Stories look was one of my faves (I just can't resist a '70s number, okay?). The devil is in the details: From the balloon sleeves to the high neckline and belted waist, I bet this would be flattering on so many people. If the hue is a little too retro for your taste, it also comes in black. Yes, it needs a good steam. Style Notes: This is a classic example of the utility-style jumpsuit that is proliferating on the high street right now. This one comes courtesy of Kitri and stands out thanks its expensive feel, heavy-weight fabric and oversized fit. Style Notes: I'm coming over all Top Gun in this beige Topshop boilersuit, which comes in a suitably pilot-inspired, light cotton fabric. The fit is reasonably tight (I'm wearing a size 8), so I would size up if you want a baggier fit or have a larger bust. Style Notes: I know I'm stretching the definition of high street here, but I couldn't not include Ganni's cult boilersuit (although Whistles's floral jumpsuit is more expensive). The fit is satisfyingly boxy and slightly oversized, which is just what I want from a boilersuit, and the pale-pink hue is perfect for spring. It is worth noting that the trouser length is on the longer side (I'm around 5'7"). Style Notes: Out of all the jumpsuits I tried on, this was one of the comfiest, due to the soft-feel fabric, however, the only downside is that it didn't hang quite as nicely as other sturdier iterations. If I tried this on again, I might be tempted to size down to avoid any bunching at the waist. Style Notes: Forget LBDs or spangled minis—all I want to wear to parties from now on are jumpsuits. I adored the emerald-green hue of this Topshop look and the fabric's silken finish. The neck-tie is also a fab addition, however, if I had to improve one thing, it would be extending the trouser length to the ground. Style Notes: & Other Stories throws it's own khaki-coloured offering into the ring, and it sure is a good one. I love how they've made the trouser leg wider (in contrast to Topshop's tapered fit), making it look seriously luxe. I'm also really into the slightly looser top half and the sandy hue. Style Notes: Last season's sellout Topshop boilersuit is back in all its glory, offering a flattering fit that's body-skimming but not too tight. This denim piece is an ideal starting point if you're tempted to dip your toe in the jumpsuit trend. I ended up trying on a tall version so I could roll up the trouser leg. Style Notes: Anyone who has multiple weddings this year, take note: This Whistles floral jumpsuit may just be the answer to your prayers. Its über-bright florals might not be to everyone's taste, but with its floaty sleeves and light fabric, this'll be a dream on a balmy summer's day. Just style with strappy sandals and statement earrings. 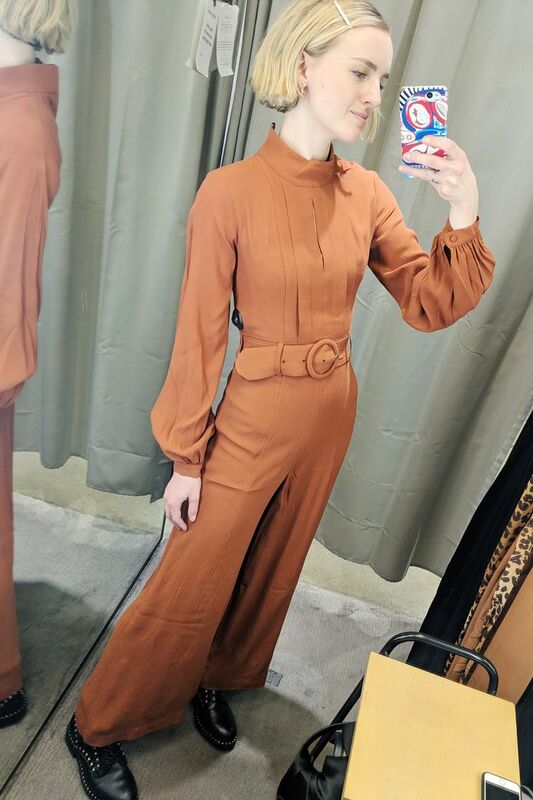 Style Notes: This is my second favourite jumpsuit (& Other Stories is really killing it this season), and the one I almost bought. I'm a sucker for a statement collar and this look packs plenty of '70s swagger. It fit me like a glove (thanks to the waist-tie detail) and is so close to perfection. My one peeve is that the trousers cut-off at the ankle. I think it would look more expensive if the legs were full length. Style Notes: This grey jumpsuit offers a little light relief amongst the many sand-coloured boilersuits and '70s styles. The light-grey fabric offers a more minimalist spin on the trend, and I love how it feels more tailored that some of the other pieces. Style Notes: I had a moment of madness and decided to remove the belt from this leopard-print jumpsuit and use it as a neck-tie instead. And you know what? I love it so much more now. The fabric is quite light, so when belted it looks a little pajama-like, but if you want more definition, I think it would also look chic with a wider, leather belt. Style Notes: Yep, Topshop's boilersuit also comes in black. As a smarter dresser, I slightly prefer the darker hue, and I also like the contrast stitching, which gives it a designer finish. I'll wear with lace-up boots now and leather mules in summer.